Thanks to Steve Bass and his great TechBit newsletter for passing this along. I hate predictions for the New Year but I have no self-control so here goes. This is one I made two years ago and is probably my most accurate prediction of the past. The market has been flooded with solid state memory and some companies have scaled back production in an effort to keep prices stable. As the year goes on, the cost of SSD’s will come down and the size and speed will go up. Even though we’re getting a new Windows this year, sales of Desktops won’t come close to the increase in large laptops and small netbooks. Companies will try their best to differentiate themselves from the competitors. Lenovo is even coming out with a ThinkPad with a screen that slides out to provide a dual screen experience. I have discovered when I travel Wi-Fi coverage can be spotty. Hotels which boast high speed Wi-Fi connections but they aren’t doing a very good job. Even at a recent Microsoft conference I ended up using my Verizon EV-DO connection because it was faster than the Wi-Fi provided. Currently the best reason to use 3G over WiFi is security. Keep your WiFi networking at home and use 3G when you travel. I’ll admit I’m not a fan of Cloud Computing. As far as I’m concerned I’ve already done Cloud Computing, it was called a main frame and dumb terminals. The reason we got rid of main frames wasn’t just COBOL. 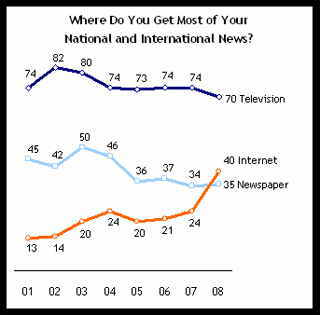 While television still tops our source of news, a recent Pew study said for the first time the Internet has passed newspapers as a more popular source of news. We will see the failure of many newspapers and you can bet they’ll go to Congress for help in keeping the news print tradition alive. What I’ve seen so far of Windows 7 is promising and I think many people really really want it to succeed. My real prediction is the Microsoft will actually price Windows 7 so that people might actually buy it instead of trying to get a copy from their friend. 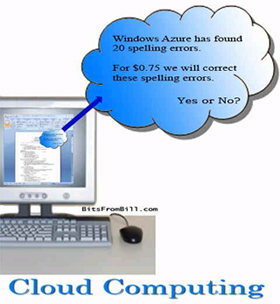 When Vista first came out Bill Gates said it would be “less than a hundred dollars”. That was the price for Vista Basic which was useless and a downgrade from Windows XP. Expect fewer versions of Windows 7 to be available to ease the confusion. What are your predictions? Disagree? Click on the Comments link below. Like many of you we had a very Wii Christmas. Everyone on Twitter seems to be talking about their new Wii and our three adult daughters all received new Wii’s from Santa. Everyone on Twitter is either nursing their sore Wii arms and asking the Wii pros what game to get next. I’ve had my share of Wii injury’s so I thought I’d share my favorites. 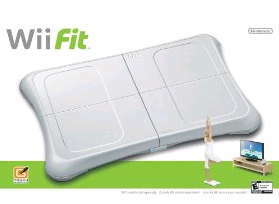 The ultimate addition to your Wii is of course the Wii Fit. This was a popular gift over the holidays. Our daughter Amy has already been shopping online for a Wii Fit hoping to have it at her house in Portland by the time she returns. We had planned on a Wii Fit for her February birthday but she couldn’t wait. This is probably my favorite. I’m not a real gamer but I’ve had a blast with this one. We have grand kids in Germany and every Saturday we connect to the Internet, play Mario Kart and race against the kids in real-time. Lego Star Wars: The Complete Saga is a true game for all ages. Our six year old grandson has mastered this game which requires a combination of fast action and a puzzle-like thought process. We can also play this one together and seriously play as equals. Star Wars The Clone Wars: Lightsaber Duels scared me when I first saw it but then I realized the kids don’t actually hit each other. 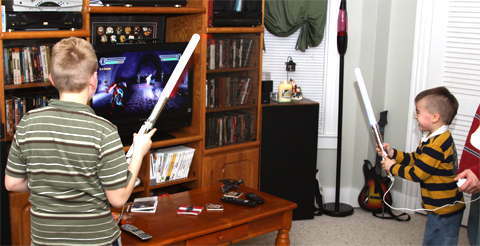 They swing the lightsaber and the characters on the screen do the fighting. I’ve only scratched the surface of great games and it’s time for me to play again. Please share your ideas. What are your favorite Wii Games? Click on Comments and let us know. For the programmers out there I have one other recommendation. 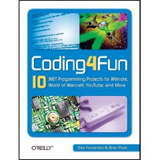 Learn how to create a program on your PC that uses the Wii controllers by checking out Coding4Fun: 10 .NET Programming Projects for Wiimote, YouTube, World of Warcraft, and More . May this day bring you all peace, relaxation, fun and lotsa love. 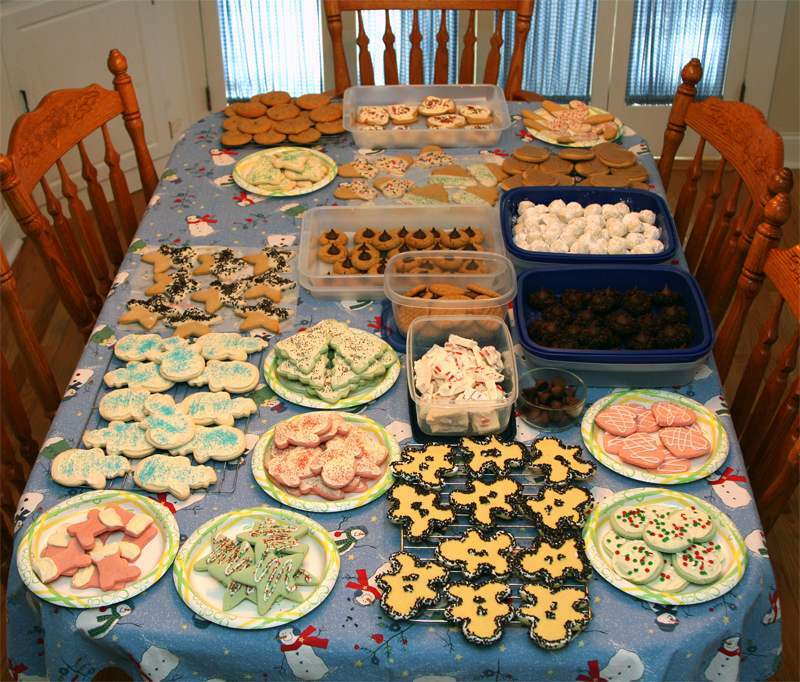 I share the following photo of the good cookies to whet your holiday spirit. 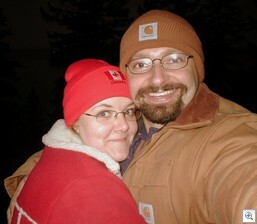 I first met Paul and Robin when they were just beginning to be a family and immediately knew they were good folk. Along with the help of many brilliant friends their CastleCops website was one of the top forums to go if you needed help with spyware. They were so successful that they were constantly the target of denial-of-service attacks by the bad guys. I was sad to see this final note when I visited CastleCops.com. You have arrived at the CastleCops website, which is currently offline. It has been our pleasure to investigate online crime and volunteer with our virtual family to assist with your computer needs and make the Internet a safer place. Unfortunately, all things come to an end. Keep up the good fight folks, for the spirit of this community lies within each of us. We are empowered to improve the safety and security of the Internet in our own way. Let us feel blessed for the impact we made and the relationships created. With respect to the server marathon, by March 17 2009 CastleCops will refund contributions made through PayPal that were specifically designated for servers. Unfortunately, server donations made via check cannot be returned because we do not have the addresses for the donating entity. Unless instructed otherwise, CastleCops will re-allocate these funds as a donation to the Internet Systems Consortium (ISC.org). This organization sponsored our hosting environment for approximately the past 2 years. Please contact us [cc at laudanski dot com] before March 17, 2009, if you would like a return of your server marathon donation. Otherwise, we would like to thank the ISC for their unfettered support. We thank everyone in creating our unique footprint and memories in time. Thanks to Paul and Robin and all the hard working volunteers who helped all the CastleCops visitors over the many years. Is Google Still the Best Search? As a Microsoft MVP I was asked to just try Live.com for a week and report back to Microsoft. What I discovered surprised me. In May 2007, I wrote about testing Ask.com. In October 2007 I did some extensive testing of Yahoo Search. So I thought it was time to update my impression of various search engines. I discovered that I never go to a main search page like Google.com anymore. That means I miss what ever cool Google logo has been created for the day. The main Live.com has nice color photo background which changes daily but I guess I’ll never see that either. Live.com does provide some mouse-over links relative to the image which is nice. For the last couple years I found myself just using Google toolbar for my search. I’ve actually been using Google’s Chrome most of the time so now I just type my search directly into the address bar and voila. So good bye to toolbars and sayonara to main search pages. Using my traditional search, the Pytlovany Test Live Search didn’t score to bad. For years I’ve been able to test search engines by using my last name because it’s so unique it has always worked well. Yahoo claimed the most with 32,500 pages in English. I didn’t get a chance to check them all out. Typically, I never go past the first page of displayed results so the number of pages found becomes less important. I was surprised to see that Ask.com cleaned up their results so it no longer included a lot of the bogus sites they used to list. I started to test other search terms and Ask.com failed again. Live.com and Google both provided the best results in the way of relevant pages. I did notice one big change in Google from previous tests and other search engines. They now seem to give more weight to the social Web 2.0 sites like Facebook, LinkedIn and even Twitter. Google and Live.com did best in presenting related ad based sites. Yahoo and Ask.com failed and displayed sites that are either dangerous or use keywords of their competitors to steal your business. I could still find some questionable ads on Google and Live.com so they both need to spend more resources on reviewing their advertisers. Like Google, Live.com has been introducing some special features that will help bring on new users but as expected Google still maintains its hold on the search market. According to my most recent research Google still holds over 65% of the search market. Yahoo and Live/MSN are still doing their best to put a dent in this but Ask.com has all but disappeared from the stats. Over the years most of you have been inundated with buzz words like virus, spyware, worm, trojan, rootkit and over the last year Zero Day has been popular. The zero-day term refers to an attack or virus which is previously unknown so no patch or virus defination is available to catch it on day zero. It won’t be caught by your antivirus scanner because they don’t know about it yet. A Zero Day “Vulnerability” is the worst. This attack uses a flaw in a program such as the browser that allows code to execute with no warning to a user. You don’t have to be tricked into downloading anything. All you need to do is to visit a web site or in some cases just be connected to the internet. The only protection will be programs like WinPatrol that monitor for changes to your system. This week Microsoft has released an advisory to protect users until a patch is available. Click “Vulnerability in Internet Explorer Could Allow Remote Code Execution”. Microsoft advises some pretty serious work arounds including. These are pretty drastic actions but this threat should be taken seriously. Most experts are recommending folks stop using Internet Explorer completely until Microsoft has a patch available. I’m among those experts who also recommends finding a new browser for a while. Personally, I’ve become a fan of Google Chrome which is now out of beta and has an official version 1. 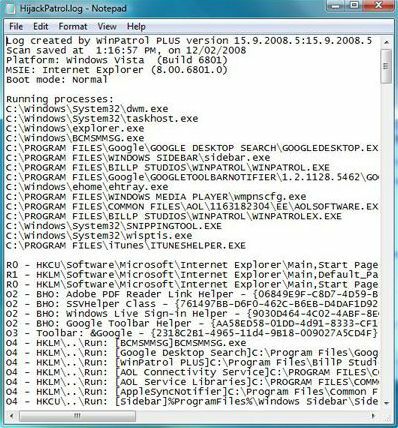 WinPatrol is known for many functions and is often classified as a spyware monitor or an AutoRun program manager. Over the years I’ve packed a number of important functions into two small program files that make up WinPatrol. WinPatrol was a first of its kind intrustion detection program 11 years ago and continues to have many unique features not found in other utilities. WinPatrol is a program I use personally on every computer I own. It really runs in the background without slowing down other applications. Its small foot print, robust proformance and new features are based on what I want myself and I hope you do too. I’ve put together a list of features that some folks may not know about. While WinPatrol can be used as a one time tool to clean up your startup programs, perhaps you have some programs you’d like to keep. 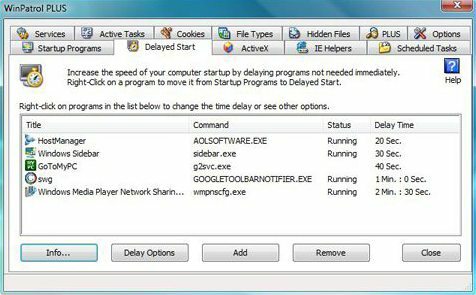 Using WinPatrol, you can schedule some programs to run once your system is up and running successfully. It’s not unusual for malware to change your auto update setting but some folks noticed that occasionally Microsoft has been known to change this value also. Either way WinPatrol is one of the only programs designed to alert you to this kind of change. Have you ever wondered when you installed a new program? WinPatrol will keep track for you. This works best when, as many do, you install WinPatrol as the first application on your new or restored computer. If you’re ever infected with malware with random filenames this feature makes it easy to pick out all the related bad guys. Many legitimate programs from Apple, Adobe, Google and Microsoft think they’re so important that just running the program they’ll add companion applications to your startup list. WinPatrol’s “Disable” button will tell WinPatrol to remove them automatically when added to your Startup list. This feature was originally designed to prevent malware from changing .exe and script settings. It has proved to be useful to stop programs that try to reassign themselves to play your MP3’s or edit your JPG files. WinPatrol PLUS is designed to be educational. We now have over 20,000 program descriptions created so they can be understood by mere mortals. PLUS members can just double click for more information on any program they find. While MSConfig will show you the basic RUN registry startup locations, WinPatrol digs deeper into the registry to display programs using non-traditional locations commonly used by malware and even some legitimate programs. 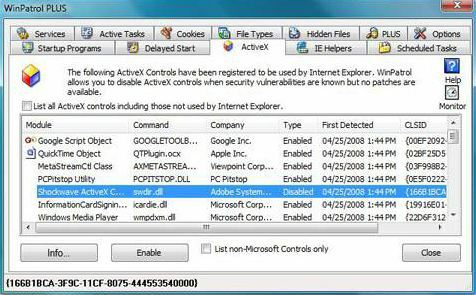 You won’t have to wait for a Tuesday security patch when a new activex vulnerability is found. WinPatrol allows you to safely use the kill-bit function to disable any dangerous code objects. Many online helpers have become accustom to reading logs from HiJackThis. WinPatrol creates a log using this familiar format while including additional benefits. If you haven’t looked at WinPatrol lately, I’m hoping you’ll give Scotty another look. It’s a small download at http://www.winpatrol.com/download.html. Thank you to everyone who has supported the development of WinPatrol by upgrading to WinPatrol PLUS. I wouldn’t be able to continue adding new features without your support. Feel free to add some of your own favorite unique features as comments. First, thank you to all for the cards, Emails, Prayers and well wishes while I was recovering from a recent hospitalization. Everything is progressing according to plan and I’m anxious to get back to work on new WinPatrol features. While I was recovering I was able to spend time doing a little holiday shopping. I know most of you will be doing the same this week so I wanted to offer some specials on the purchase of WinPatrol stuff for your friends and family. This week I’ve reduced the price of our WinPatrol 1 GB wristbands and WinPatrol Sport Shirts.